In May I was lucky enough to travel to Italy with my family. It was a wonderful two weeks spent traveling from Venice to Lake Como by train. I highly recommend it. It's truly beautiful and very inspiring as far as my creative side is concerned. 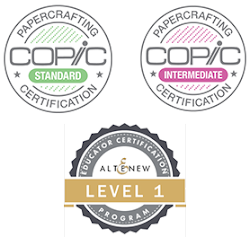 I came back refreshed and ready to start Level 2 of the Altenew Educator Certification Program. For my second class, I chose the Color Your Day Lesson 1 to create with as it suggests using photos for inspiration on color. I knew when I took these pictures I wanted to use them for color inspiration so I was all set. 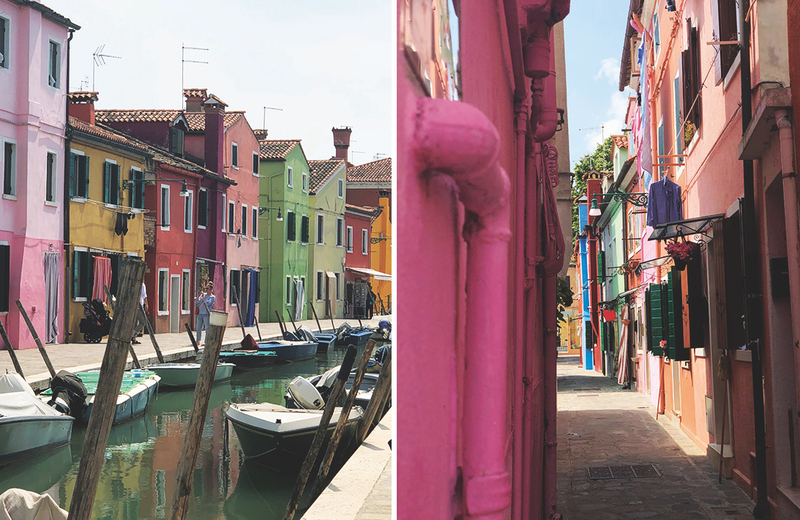 But first a little bit about Burano. It is a tiny island just outside of Venice. You can take the public ferry to it (takes about an hour). Both times we have been, we go to the more well known and popular Murano, known for its beautiful glass. Murano is beautiful and the glass is impressive but I always feel right at home the minute I get to Burano. It is a portion of the size of Murano and their commodity is beautiful hand woven lace. On any given day you can see the lovely ladies of Burano sitting on their stoops weaving their beautiful creations. There are beautiful lace shops and delicious restaurants to entertain you for hours. But the most beautiful thing about this little island is the buildings its residents call home. Never do you see the same color of home twice in a row and many are beautiful pastel colors. It's a color circus for the eyes; that's what inspired today's card. 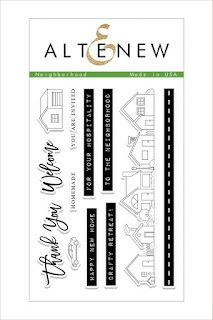 I chose the Neighborhood Stamp set from Altenew and paired it with Polychromos Pencils to color my little houses. It gave just the right chalky affect that the buildings have. This place is beautiful in its imperfections and I took complete advantage of that and, of course, I needed to experiment with a new card design. Let me know what you think. Today I am also trying out recipes for my cards. In an effort to get you the information you need to you quickly and efficiently, I am going to streamline directions for the cards I make. Each card will be accompanied by a list of supplies, paper measurements, and colors used in various media (e.g., colored pencils, markers, inks), and numbered directions to create the card. 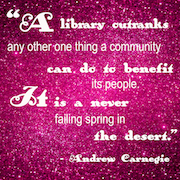 Unless otherwise indicated, the cards will be the typical A2 sized card (4 1/4" x 5 1/2"). • Nesting Paper Punch, Circle 3/4"
1 - 2 3/4" x 5 1/2"
1 - 2" x 5 1/2"
1 - 3/4" x 5 1/2"
1 - 1 3/4" x 5 1/2"
1 - 1" x 5 1/2"
Score card base at 2 1/8" and 4 1/4" to create an easel card. Fold in half and burnish the fold line with your bone folder. Mark the center of the fold line and bottom edge of the card. Center and punch a half circle using a punch or die. I used a 3/4" circle punch. I have a strip cut to 3/4" that will fit. This can be changed according to how you cut this notch. Put 3/4"(or whatever size your using) strip into the whole from the inside of the card. Put a small piece of Scor-tape on bottom edge where you marked the center. Fold the 3/4" strip about a half inch from the end and adhere to the Scor-tape on the front of the card. Stamp the house row on the 2 3/4" piece of card stock at the very edge. Create a mirror image of houses on the 2" piece of card stock by using any piece oof acetate you have. In this instance I just used the piece that was protecting the stamp set I was stamping with. Stamp the image on the acetate in Versafine Onyx Black Ink and then line the acetate up with the edge of the paper ink side down. Carefully put the acetate down and press the image onto the paper. Color the larger house piece with the colors full strength. Color the smaller house piece very lightly, somewhat imperfectly. This, after all, is a reflection in the water. Color the sky with the BG000 Copic Marker. I use a combination of strokes right across the page and random coloring until I am happy with how it looks. Color the sky reflection using the same marker with a lighter hand. Stamp Welcome sentiment in the center above. 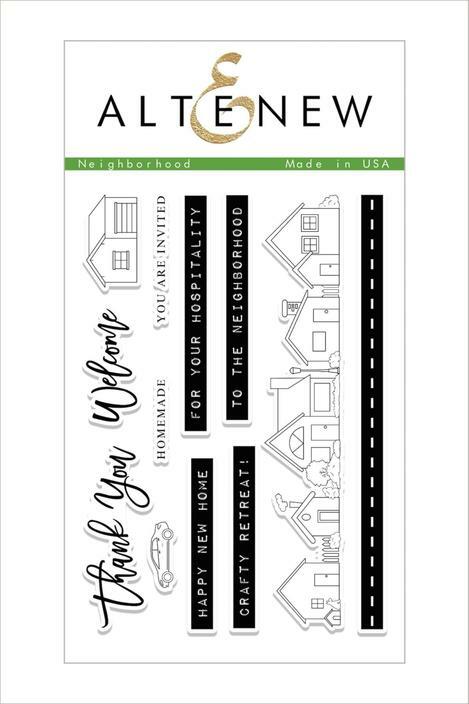 Stamp to the neighborhood sentiment on a scratch piece of card stock and trim the edges. Notch the large piece of pattern paper in the center so it lines up with the card base. Adhere the Welcome piece to the bottom half of front of the card only. Adhere the large piece of pattern paper to the top of the card base front. Be sure to not apply any adhesive on the overlapping area. Open the card and adhere the mirrored image in the appropriate location. Add the pattern paper to the edge. Stamp and punch out (or die cut) Pull Here. Also punch or die cut a plain white circle out of scrap white card stock. Trim pull strip to card edge on crease side. Attach Pull Here to front and plain circle to the back. Can certainly see how those area would inspire you to color. LOVE the reflection idea and using the acetate to create the reflection stamped image!